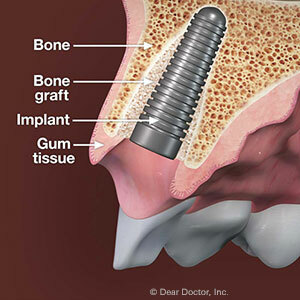 Dental implants are popular with both patients and dentists for their durability and likeness to natural teeth. That natural look, though, can be difficult to attain, especially in what’s known as the “smile zone” — the area of the mouth where teeth are most visible when you smile. Our biggest concern is the upper front teeth, where the gums are most visible, especially if you smile widely. It takes considerable skill, experience and artistry to position implants in this area so that they appear to naturally emerge from the gums and blend well with other teeth. To obtain that natural look, we must first assess whether or not there’s enough bone present, which tends to dissolve (resorb) when a tooth is missing, to sufficiently anchor the implant in the right position. There also needs to be sufficient bone around adjacent teeth to support the tiny triangles of gum tissue between teeth called papillae. Without the papillae an unattractive black hole may result between the implant and an adjacent tooth or implant. Another factor we must consider is the type of gum tissue you have. Everyone generally inherits one of two types of tissue from their parents: thin or thick. The type you have can influence the way the implant appears to emerge from the gums. If you have thick gums, they’re easier to work with and can cover more of the implant. Thinner tissues aren’t quite as easy and are less forgiving if an implant isn’t placed as precisely as possible. In recent years, improvements in implant design have sought to provide greater stability around bone and gum tissues to offset some of the issues we’ve mentioned. A variation on the design of the top of the implant (where the crown is attached) changes the direction of growth for gum tissues from a horizontal orientation to a vertical one, which can help with the final appearance. The first step, if you’re considering dental implants for a tooth in the smile zone, is to visit us for a complete examination to see if any of these factors may have an impact on your situation. We can then advise you on the best course of action to achieve the most attractive smile possible.